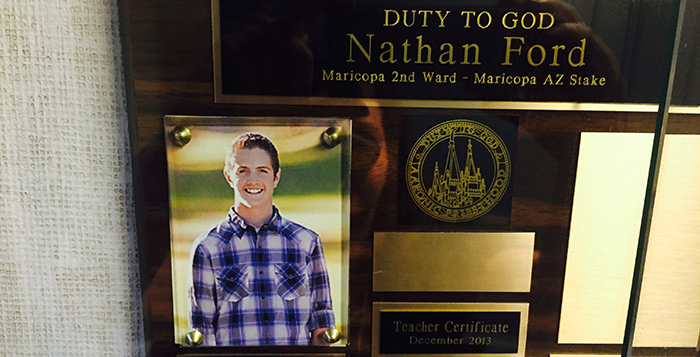 Nate Ford earned his Duty to God award of the LDS church in 2013, the plaque on display at the Bowlin Road chapel. While the Rams feel his absence profoundly, the presence of Nate Ford will be felt throughout Maricopa High School football team’s season. According to coach Chris McDonald, the team is memorializing his locker. They will carry his helmet, shoulder pads and practice jersey out to every practice “as a symbol that he is still with us,” he said. They will do the same for games, designating an area on the bench for his jersey and helmet. “We are also going to line up with 10 on the field in opening kick-off/return as well as defense for the first play,” McDonald said. The first game of the season is Friday at 7 p.m. Before the game, MHS will honor #42 with a special presentation. A 6-foot-2, 190-pound senior linebacker, Nate Ford died in a traffic accident Friday, just days before his 17th birthday. Family and friends are inviting the community to participate in a balloon release for his birthday on Wednesday at 7 p.m. at Copper Sky Regional Park. More than 400 people attended a special gathering Saturday night at the Bowlin Road chapel of the Church of Jesus Christ of Latter-day Saints, where a video of Nate was shown and friends were requested to write down a memory of or thoughts about him to be collected for the Ford family. A Wells Fargo account was set up to help the family with expenses. A fund-raiser Saturday and Sunday at Zoyo Yogurt also went to that account. Nate Ford T-shirts with the slogan “Everyday Hero” are being sold on Etsy.com, and all of those proceeds will also go to the Wells Fargo account. The family plans on donating extra funds to the MHS athletics program. F&A Cattle and Engineered with Layton donated the printing costs of the shirts. The funeral is set for Aug. 29 at 10 a.m. at the LDS stake center, 37280 W. Bowlin Road.